It is Wednesday the 2nd October 2002, We went to the shops in the daytime, The dogs stayed home, came back and cooked tea. After everyone had eaten I used Ben for a pillow while the computer backed up information, then he and Shez had some Twisties, ice cream and he took Deb to the pantry to get him some biscuits. Later every one went to bed. Ben slept in his usual spot next to the bed. During the night I heard some one making strange noises but did not think anything of it. In the morning Deb let them out for doing their business, She noticed Ben was acting kind of strange but thought it was his leg acting up. Later I went to get him out from under the car, He walked around the 4WD and collapsed. I carried him in and put him down on a bean bag. We gave him some Metacam thinking its his leg again, He seemed OK and had all his senses, but he started getting weaker he seemed to only be able to move his head, We still thought it was his leg, He just lay there and would not eat, he had a little milk and a hour later he cried and then went stiff with his legs stretched out straight and his head tilted back. He looked to me like he was dying, We loaded him into the car and took him to the Mirrabooka vet who put him on oxygen and a drip. We went home and rang back an hour later. They said he was the same, but 10 minutes later they phoned back and said he passed away. It was 1230pm on the 3rd October 2002. 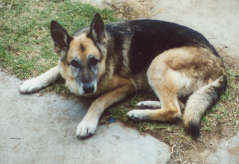 He was 13 years old and died 3 days before Sheba's death 6 years ago. We dug a grave, went to fetch him and put him in to rest next to Sheba his best friend. Is it not strange how some one can be so healthy one moment and die the next? The Vet thought his heart gave out. Then again it seems to have taken last night and today till 1230pm for him to die. At least Sheba and Ben are once again together. No more will there be a big head looking out the window. No more a Big boy waiting for me to help him in and out the 4WD. No more a big boy to hug and love. And I guess no Adelaide for him after all. I still cant believe his gone, so sudden and quick. The end of an era has come. Both my babies are now gone. Resting next to each other for all time. Ben I love you and miss you, thanks for a wonderful 12 years we all had together, Rest in peace my little baby. All my loved ones are dying, WHY? ?